Review Here, Release There & a Sale? Business here at Doctor Ben's is still extremely busy even though the Tax Deadline (USA) quickly approaches and Spring Break is finally over and Easter is coming us fast. All this means that as soon as the weather calms down you may be tempted to wander out and see what going on beyond your front door. Fear Not! We'll still be working to finally get to that huge basket of Cal Freight detail castings that have been piling up as we've been able to identify them. 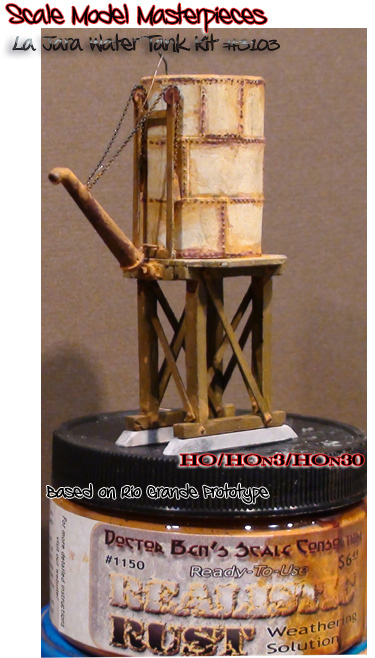 Plus, we're revamping a few kits such as the HO Rubbles Depot and La Jara Water Tank kits. We'll keep you posted as soon as we have updates ready. As always, remember weather your models and tell your friends about us and check out the Tax Season Flash Specialat the bottom of this Newsletter! See you in the Hobby Room! This is a much bigger c ontainer of weathering product than the little thimble that other folks offer-PROMISE! ... They're Not a Powder and They're Not a Chalk, They ARE Industrial! 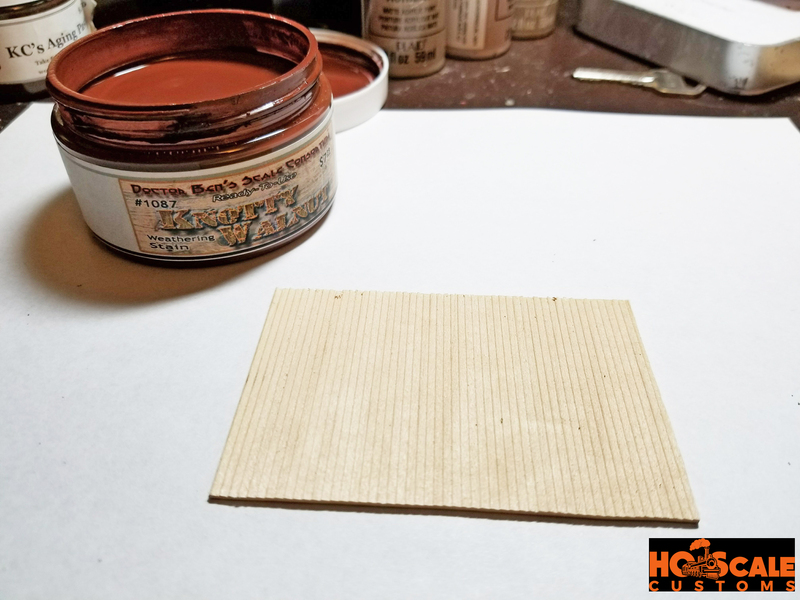 As a single component of the Doctor Ben's Weathering Products, the Industrial Weathering Pigments are an even more powerful tool in creating a realistic Model. Not a powder, not a chalk, the Doctor Ben's Industrial Weathering Pigments are very easily applied using a soft, but stiff, brush. However, be careful, a little bit goes a very long way! 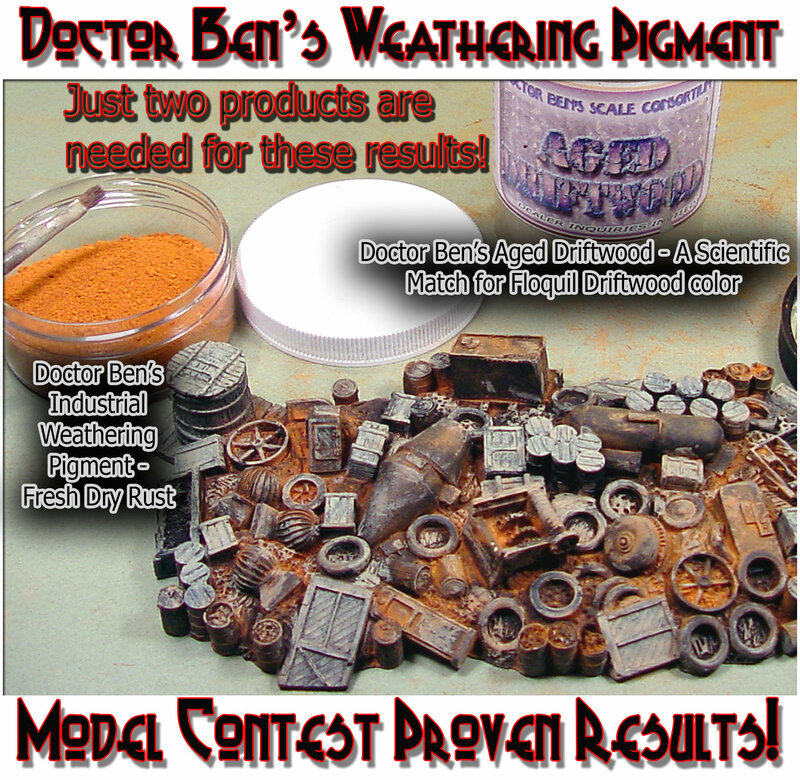 Please CLICK HERE for lots more details about the amazing Doctor Ben's Weathering Solution products!. Instructions to Assemble & Weather this Kit Seriously, this is NOT rocket science-it's just some minor assembly and weathering! Measure & remove the track ties that would be across the pit and then cut & glue (CA) the five (5) metal support bars as shown and then cement the NBWs on the outside of the rails in line with the support bars. Measure & cut to fit the two (2) timber risers and cement in place below the track rails. 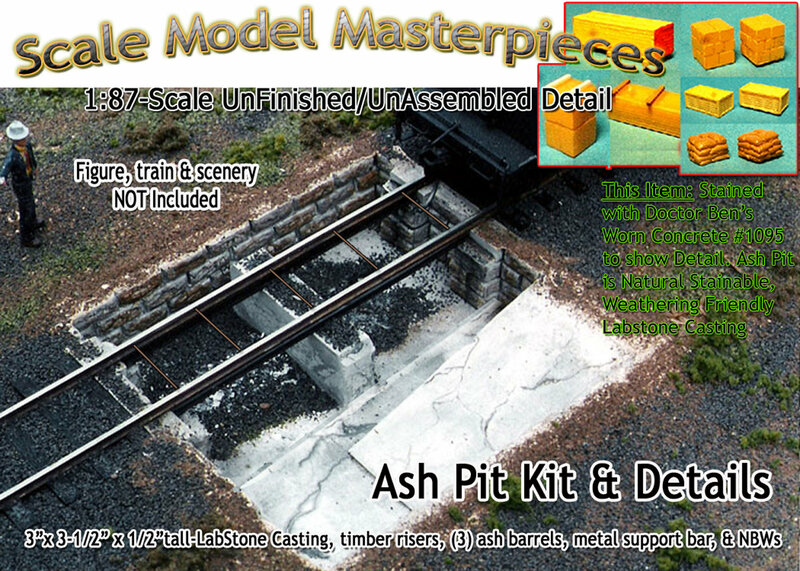 Glue the track ... Click Here to see all about this product! 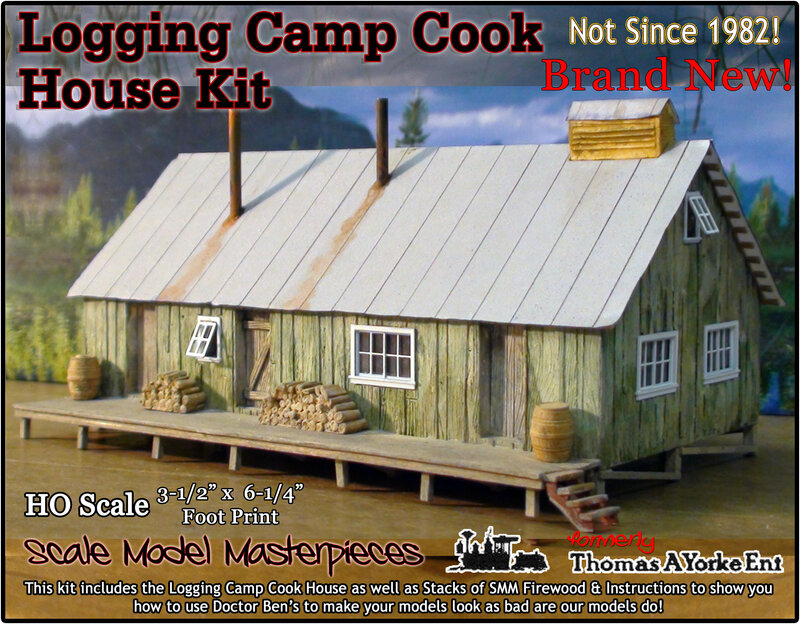 HO & O Scale Logging Cook House Kits! Not long ago we told you that we would make this kit once again available. It seems that many customers wanted to have just the Cook House for their Logging Camp. So we have bumped up the re-introduction of this kit. Note: Affiliate links may be provided in this article to you at no cost. As always, the opinions in this article are still our own. If you’ve checked out any of our work, you’ll see that we love to weather buildings. Todd and myself both equally enjoy adding that old, beaten and weathered touch to our structures. It just brings a building to life and really makes them pop. So we were very excited that we were given the chance to weather or add some depth to our structures with a new (to us) product. Continued Here for the rest of the Review! Now available with Tar Paper Roof & Lots of Options including Corrugated Roof! "Brand New in O Scale!" The detailed plans and instructions guide the modeler through the assembly and include complete Doctor Ben's painting and weathering techniques and information. 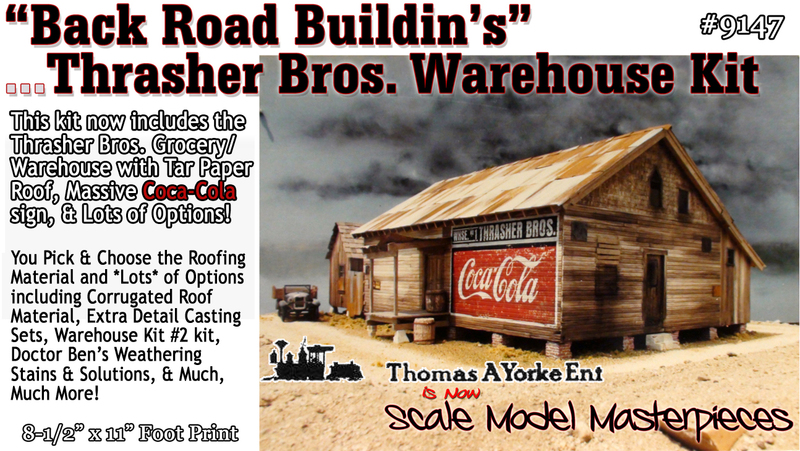 This kit includes Grandt Line plastic details, Kappler scale wood, Doctor Ben's Corrugated roofing, and Scale Model Masterpieces/California Freight details. Foot Print: 8-1/2" x 11". CLICK HERE for more about this product! What's a Tax Season Flash Special!? With the USA Tax Day happening on Monday our Tax Season Flash Special starts today and ends Midnight. Monday April 15, 2019 EDST). Practically everything*--almost 1,000 items-- in our Website is 5% Off --> Doctor Ben's Scale Consortium - Scale Model Masterpieces/Thomas A. Yorke Ent. - California Freight & Details Company - Narrow Gauge & Short Line Gazette - Grandt Line Products - And many, Many more products... Practically 1,000 items! Sale Code to use at Checkout: apr15 needed! Just spend $25 and the website does all the rest for you. All Credit Cards- AMEX, VISA, MasterCard, Discover, and Paypal, Checks, and Money Orders, where practically everything* in our Website is 5% Off. And, if you forget to buy something, you can use this Code a Second time!! Maybe the Last Chance for the Fall! * Please Note: There are only two groups not included in this sale: OOP/Fine Scale Miniatures HO Consignment Kits & Smoky Mountain Built Up Dioramas. Also, this is a www.debenllc.com Website Only offer and is NOT available in our Ebay, Etsy, Bonanza, or Ecrater Stores. Help your fellow modelers by submitting a www.DEBenLLC.com Website Product Review for for your purchases) on Our website! This is a brand new feature on our website so here is a chance for your to be one of many other customers to share your Doctor Ben's product experiences. . And be sure to join the almost 1,800 Friends who Like our facebook Page, too! 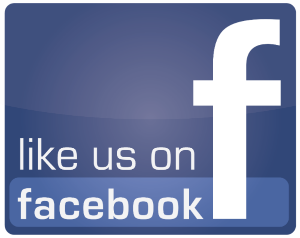 DEBenLLC & Doctor Ben's FacebookPages Social Networks!